Originally named Bull’s Island, it was part of a tract of land owned by Epaproditus Bull. When the War of 1812 began, Bull and his family left the area for the safety of Cleveland. After the war, Bull's family returned to the area and remained there until 1852. Leonard B. Johnson purchased the 300 acre island in 1852, renaming it Johnson’s Island. Johnson cleared several acres of the island for farming. Johnson Island is located south south of the Marblehead peninsula and is accessed by a causeway toll road. Johnson’s Island was chosen for a new prison site in the fall of 1861 and the first prisoners arrived in April 1862. In 1990 the island was recognized as a National Historic Landmark for being the only prison designated just for Confederate Officers. 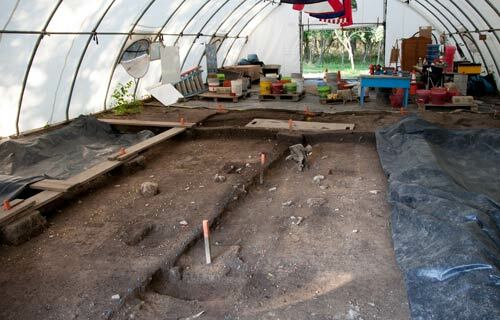 Archaeological studies of the site have been ongoing since the late 1990s. ABOVE: Archeological excavation of one of the large block houses. Also under excavation are the the sites that served as the numerous latrines. Many items fell into the large pits, either accidentally or on purpose. Because they were covered over, these items were preserved. The island's isolation made it an attractive site for housing Confederate prisoner of war officers. There was a 40-acre site already cleared on the side of the island facing the city of Sandusky which was only 2.5 miles by boat from the island. A rail depot in Sandusky made it easy to transfer prisoners and supplies from anywhere in the country which were then transferred to the island by boat. At the time the prisoner of war camp was being built, the island was inhabited only by the owner L. B. Johnson and his family. During the 40 months the camp was in operation, more than 9,000 prisoners crossed Sandusky Bay to the Federal Docks for confinement in the 12 prison blocks inside the stockade. Periods of confinement varied depending on when the prisoners arrived. For the most part, the first prisoners in 1862 were exchanged after only 5 months while those arriving after Gettysburg in July 1863 stayed for 12 - 18 months. The average number of prisoners confined at one time were about 2,000 - 2,500. About a half mile north of the Prison walls is the cemetery where a number of those that died while being incarcerated died. Today, the cemetery has been restored and fenced in. Marble headstones have been erected. At the time of their burial, a wooden cross with their name and rank was placed on the grave. Over the years, those wooden crosses began to deteriorate and no record was made of the graves. 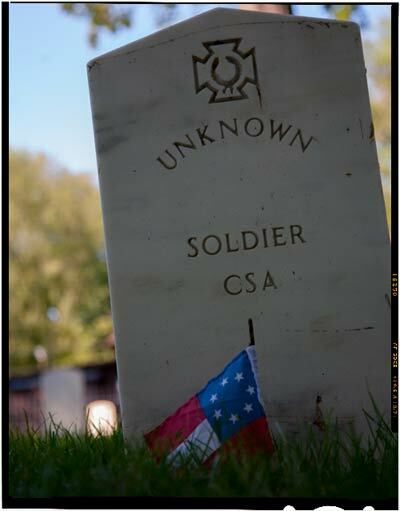 This is why so many of the early grave sites on the south side of the cemetery are identified only as "Unknown". In 1890, the original wire fence that surrounded the cemetery was replaced with the current iron fence and wooden grave markers were replaced with headstones of Georgian marble. It was unknown whether the headstones correspond to the actual positions of the graves since prisoner diaries conflict with the grave locations. In 1904 the Daughters of the Confederacy purchased the 100' x 485' cemetery site and erected the bronze statue in 1910. In 1932 the cemetery was turned over to the US Department of the Interior whose jurisdiction it remains. After the war, the Prison Depot was decommissioned in September 1865. The last 9 prisoners, including 2 diehards who refused to take the oath of allegiance and 2 who were charged with piracy, left the island on September 5th. The buildings, lumber, and surplus materials and equipment needed to run the prison were auctioned off during 1865 and 1866. Leonard Johnson, owner of the island, was the high bidder for the buildings and lumber, which he eventually sold. A few of the buildings were brought across the ice to Marblehead and used as dwellings. None of the buildings remain. From 1866 to 1894, the island was used primarily for agricultural purposes. Fruit trees were planted along with general crops. The site of the Prisoner of War Depot was plowed under to raise crops. A small number of private lots were sold to individuals during this period. In 1894, a short-lived resort was established north and west of the Confederate Cemetery. In 1904 a second short-lived resort opened in 1904, but competition from the new Cedar Point forced its closure in 1907. In 1956, plans were made to develop the island as a vacation home site. A causeway to the mainland was approved and started in 1964. Today, Johnson's Island is a private residential area. The only area open to the public is the Confederate Cemetery. No other areas are open to the public. The cemetery is the only site remaining from the original POW Depot open to the public. There are neither comfort stations nor public picnic areas on the island. Traffic regulations are strictly enforced. The prisoners began each day with and early morning formation and roll call, regardless of the weather. An evening version was repeated. Between roll calls, the prisoners were free to move about within the stockade and do whatever they wanted with few restrictions. Boredom was a major problem. Baseball was played in the open area along the southeast stockade. The YMCA had provided about 600 books for the men to read. Other activities included regular poker games using Confederate script. A sutler store was created within the stockade that sold newspapers, food,clothing, and stationery items. Read about the failed attempt to hijack the only federal warship on Lake Erie and use it to free the POWs on Johnson Island.